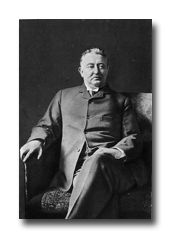 Cecil Rhodes returned to England in 1873 to attend Oxford University but he did not receive his degree until 1881 due to his repeated business trips to South Africa. Rhodes was extremely prosperous in the diamond mining industry and in 1880 formed the DeBeers Mining Company, which owned 90 percent of the world’s diamond mines by 1891. While travelling through the rich territories of Transvaal and Bechuanaland, Rhodes was inspired with the dream of British rule over southern Africa. His vision was British dominion “from the Cape to Cairo". He entered the Parliament of Cape Colony in 1881 and stressed the policy of containing the northward expansion of the Transvaal Republic. In 1885, Great Britain established a protectorate over Bechuanaland, due largely to Rhodes’ persuasion. 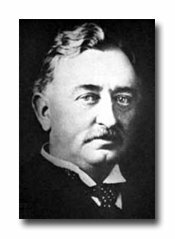 Cecil Rhodes became the prime minister of Cape Colony in 1890 and was responsible for educational reforms and for restricting the franchise to literate persons, which reduced the African vote. Rhodes’ bias towards the British victims of discrimination encouraged him in the conspiracy to overthrow the government of Paul Kruger, thus resulting in the Jameson Raid of 1895. Rhodes sponsored the raid led by Dr. Leander Starr Jameson, the Administrator in Rhodesia of the Chartered Company. The raid was intended to encourage an uprising of the uitlanders (an African term for foreigners) in Johannesburg. The plan was to stir the uitlanders against Boer rule and prompt British intervention. The plan was foiled by Transvaal government forces, which surrounded and captured Jameson’s men before they reached Johannesburg. The raid ended in complete failure and the British House of Commons found Cecil John Rhodes guilty of grave breaches of duty as Prime Minister and as Administrator of the British South Africa Company. Rhodes was forced to resign as Prime Minister of Cape Colony. His older brother, Colonel Frank Rhodes, was sent to jail in Transvaal for high treason and the incident led to the outbreak of both the Second Matebele War and the Second Boer War. Following his resignation as Prime Minister, Rhodes devoted himself primarily to developing the territories collectively called “Zambesia,” after the Zambezi River. In May 1895, the name was officially changed to "Rhodesia", after Cecil John Rhodes. Nearly 100 years later in 1979, a new constitution providing democratic majority rule was established and “Rhodesia” became "Zimbabwe" in 1980. Cecil John Rhodes died in 1902 as one of the wealthiest men in the world. Having no family, Rhodes provided in his last will and testament a large portion of his estate to the establishment of the Rhodes Scholarships. Rhodes Scholars study one to two years at the University of Oxford in England.